The Great Lakes Cichlid Society was this years host for the American Cichlid Association's Annual Convention held in Cleveland, Ohio, July 19 - 23. As most of you know by now, I live for this type of an event. I was counting down the days as early as last August. You may think I am crazy, but once you attend one of these weekends, you will know what I mean. And, once you have been attending these as long as I have, you can't wait to see the friends, that you have made for life, and only get to see once a year. The next morning I arrived at the Sacramento Airport around 8:00 AM. I was flying on United Airlines, and when I confirmed my flight, a few days earlier, I told them I would be checking fish boxes as luggage, and would they please put that in my file. This worked really great, my reservation file told the clerk exactly where to find the rules regarding fish as luggage, and it was a breeze. The Cleveland Sheraton Airport Hotel was only a few steps from the main terminal, and I was all checked in by 6:00 PM that evening without any problems. An increasing amount of people start arriving on Wednesday night, preparing for an all Cichlid weekend, if we start getting there any earlier it is going to be a Cichlid week!! I was surprised to see Lee Finley, Wayne Leibel, Rusty Wessel, Chuck Rambo, Gary Kratochvil, Ad Konings, Mike Schadle, et. al., already socializing by the time I arrived. It wasn't long before I found my close friend, Pam Marsh, and the weekend had begun! When I checked in at the registration table, I could tell this was going to be a first class event, they had a lot of special details, the registration envelope was actually a cardboard briefcase, very nice and a cute idea. The name tags were to die for, they looked like credit cards, with first names really large, for the blind, like me!!! Party, party, party, talk, talk, talk.... there was a lot of catching up to do, and before I knew it, it was already 2:00 AM, time to hit the hay! The first Tour was Cleveland Sea World and it left quite early. It seemed bazaar to me to have a Sea World in Cleveland, but there were plenty who took advantage of this tour. I elected to sleep in and hang out with the boys. After getting my fish all settled, I headed out with old friends; Eric Hanneman, Keith Shepard, Rusty Wessel, Craig Morfitt, and a few others. We went to Aquarium Adventure, a local pet store, that was very nice. It was clean and had a pretty good selection of Cichlids, although I didn't see any thing I had to have. We were back at the hotel by early afternoon and many people had showed up while we were gone. Caroline Estes, my close friend and partner in crime, had arrived, and it was time to celebrate with her and Pam. I don't think anyone could have gotten a word in edge wise, as we all talked, a hundred miles a minute, trying to get caught up on all the Cichlid gossip!! The PCCA boys had all arrived, and they were ready to jump in and join the fun. We all gathered in the sports bar for a bite to eat. It was great to see such a good showing from the West Coast. The layout of the hotel provided a great lobby with the required bar near by. Several large circular couches allowed instant round tables to form, where you could tell tall tales/tails and share ideas with fellow hobbyists from California to New York. The Bulletin Board, or I should say Boards, for fish that people were selling out of their rooms, was located in a long hallway near the elevators. There were 3 of them, that were probably about 4 feet high and 10 feet long, completely full of lists of available Cichlids, some non-Cichlids too, as well as, foods, caves, shells, etc. There were times when you couldn't even get close to see what was listed. I do believe that there were more fish in people's rooms than I have ever seen before. I myself brought 26 different species, a dozen of each. I sold or traded all but 5 bags, which I ended up putting in the auction. I was thrilled with the results, and I think a lot of people did really well selling out of their rooms. It is always fun to just walk up and down the hallways on each floor. The doors are usually open, and you can wander in and see what is available. There were quite a few people who drove, some 16 - 20 hours, so they could set up tanks in there rooms, and it was like visiting a small fish store. Others had Rubbermaid tubs, set up with sponge filters. If you didn't want to set up tanks, you could have reserved tanks, to house either fish you wanted to sell, or fish that you bought. Danko described his love for collecting Central American Cichlids, and his challenge to breed these collected fish. A humble but informative talk. Don isn't afraid to share his mistakes with the audience and told several great stories on how he was able to kill or spawn a species. It is speakers like this that allow Cichlidiots to learn from his successful experiences as well as his disasters. Kurt Zadnik, the one and only!! He is my mentor, that now lives in Ohio, and he can still dazzle the crowd! He talked about is beloved genus; Apistogramma. Unfortunately, there were really too many speakers scheduled and the talks ran over the allotted time, the Canadians, Herman and Marshall were scheduled to start speaking at midnight, but were postponed until Friday. The tour was for the Rock and Roll Hall of Fame. The bus left at 8:30 AM, a tall call for most Cichlidiots, and the bus was not returning until 5:30 that evening. Many people opted to rent a car for the day, and check out the pet stores and the downtown area, which included the Rock and Roll Hall of Fame on their on time schedule. The Hospitality room was down in the basement. The hotel had obviously heard about how noisy Cichlid people are, and how they would rather party than sleep. The room was full of large round tables, and they had a live band. I found it hard to hear the conversation, over the band, and I preferred to hang out in the main lobby. The couches were much more comfortable, and conversation was easier to keep up on. The Cichlid Show was split up into two different rooms, which was a bit confusing, because when you saw a fish you liked, and wanted to drag somebody back to see it, you couldn't find it! There were plenty of great specimens, and although some thought it was a small show, to me it was about normal. There is a new Global Cichlid Club. It is based in Toronto I believe, and it is called the Canadian Rift Lake Cichlid Association. They have members all around the world, and membership allows you to buy fish at a discounted price, granted they come from Canada, and you have to get them across the border. The neat thing is, that they are planning multiple trips each year to Tanganyika and/or Malawi. This gives the average person a connection to the Lakes. Dr. Glen Marshall and Tom Herman are the ring leaders, and it looks to be an up and coming, "mover and shaker" type of club. Glen and Tom are great guys, and I think they had a good time meeting everyone, and gained a lot of members over the weekend... they sucked me in!! Right off the fifth floor elevator lobby was the home for three guys from Bermuda; Craig Morfitt, who I have known for years and his friends Chris and Nyon. It wasn't long before the 5th floor was known as the Bermuda Triangle. They had an open room Friday night, where each guest was offered the drink of the day: "The Dark and Stormy," a concoction of ginger beer and Bermudan Rum. I called it the: "Nasty Storm," but the guys were all gulping them down. I took a quick sip, and immediately looked for a plant to water, there were none. I looked across the room and I saw Lee Finely with a near empty glass. "Hi Lee, look what I have for you, here let me take your empty glass!" ... And I was saved.... The next morning I wish I had dollar for every advil I handed out to my Cichlid boys. Rusty Wessel has great slides and gives a smooth flowing program on his love for collecting Central American Cichlids. This particular program covered him collecting in Honduras, the entire room was ready to go, by the time he ended. Jeff Cardwell... Who cares what he is speaking on, he is the one of the nicest guys in the hobby. Jeff talked about his favorite South American Cichlids, and I went just to watch Jeff!! The Cichlasoma Study Group included Eric Hanneman, who spoke on his recent collecting trip to México, and it was delightful. Five traveling friends, with a GPS locator, a couple of snorkel masks, and a rumor that the Cichlid they were looking for was above some falls, where it was once collected many years ago; the sought after Thorichthys socolofi. When the lights came on, everyone was a bit shocked to see me, the African Queen, at a Cichlasomaniac Fest. But, after these great speakers, I was ready to set up a New World Cichlid tank! It is hard to beat Wayne as a good speaker, he is so entertaining, and the program he gives on Pike Cichlids is fantastic. It is great that he is introducing this fairly new group of fish to Cichlidiots, their popularity is growing fast and it is because Wayne has a way of sharing great information as well as his enthusiasm with others, it was excellent. Juan Miguel Artigas Azas is the best, although he has been around the ACA for years, it doesn't seem like it, because he is so quiet. But, here is a man that has dedicated his life to all Cichlids, but it is obvious that Mexican Cichlids are his favorite. His talks are always worth attending, and its great to know the guy who has the #1 Cichlid web site; The Cichlid Room Companion (Cichlidae.com). State of the ACA: The ACA has never been in better shape, it is financially stable, and the publications are on time. Okay!! Lets Party!! Special Awards: 1999 - 2000 Writers award, went to Craig Morfitt, his article entitled: Lake Tanganyika and It's Diverse Cichlids. BB #195, December 1999. It is a great article, check it out. The Conservation Committee - Chuck Rambo announced the creation of the Paul V. Loiselle Conservation Endowment Fund. 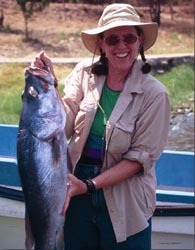 In recognition of Loiselle's work with Cichlids over the last 30+ years. I interpreted that the fund will be handled in the same way as the Guy D. Jordan Endowment Fund. The Pacific Coast Cichlid Association presented this new fund a check for $500.00 and challenged all clubs to meet or exceed their donation. Speaker: Ad Konings captivated the banquet audience with his talk on Tanganyikan Cichlids. I never tire of him speaking, he is always so informative, and he is so personable. His talks are full of dry humor, that make me laugh!! He is the man, and I love the man!!! Best of Show - Ptycochromis sp. "East Coast Yellow" owned by none other than Ron Georgeone. It was a gorgeous specimen!! The Babes In The Cichlid Hobby (Pam Marsh, President, Caroline Estes, Activities, Pam Chin, B.I.T.C.H. Reporter and an undetermined amount of BW's (B.I.T.C.H. Wannabe's) held a Silent Auction, and solicited Cichlid related items from the elite of the ACA. We were hoping for 12+ items so that we could raise some funds for the Guy Jordan Endowment Fund. We were totally shocked when we ended up with over 100 items. They included: Original art work; a picture of Guy Jordan with his infamous Pablo. This picture won the Art Class at the 1984 ACA convention, and was printed on a BB. Several old pieces of Aquarium literature that dated from 1899 to 1950. A 29 gallon tank with hood, 50# piece of Holey Rock, 15 vintage T-shirts from previous conventions and workshops that had never been worn. There were also books, jewelry, Fish socks, a giant stuffed pillow in the shape of a catfish, to name a few items. We were totally beside ourselves when the Auction took in $1,930.00. Along with our T-shirt sales we raised a total of $2,400.00. Look out the Babes In The Cichlid Hobby are here to stay, and have proven how valuable we are to the ACA. With the announcement of the Paul V. Loiselle Conservation Fund, it was decided that we would donate our proceeds, to help seed this worth while project. The response was unbelievable, everyone thought it was a great idea and encouraged it. It is now the last night for most people, and everyone is a little blue. Last chance to visit with old friends, and with the new friends you have made. Party, party, party and the Cichlid talk goes into the wee hours of the morning. The Auction started at 9:30 am, fish were sold for about an hour and half, then the dry goods were sold, this took about hour and half and then back to fish. The last bag went at about 11:00 PM that evening. There were 1495 items, which must have included about 500 bags of Sciaenochromis fryeri "Electric Blue" and Labidochromis caeruleus "Lions Cove Yellow." Next were Apisto's, then peacocks, and mbuna. It was a bit strange, but they didn't use the color dot system. There was no one in charge that I could find, and people were just placing there auction fish wherever they would fit on the tables. When they started auctioning off the fish, they started on one table and followed it around to the others. This is really a bummer, because if you put all your fish on one of the later tables, not only did your fish not go until late that evening, but all your fish went at the same time. There was not a projector showing the fish, so it was important to listen to the bag number. They did have the "Express Bag," where you can take any bag off any table, and for a fee of $3.00, you can get it auctioned off next. This applies whether you are a seller or a buyer. Once again, it is buyer beware, there were lots of auction tags that were not filled out properly. On many of the bags, the name of the seller was no where to be found. What is up with this, are people too embarrassed to put their names on the bags??? I saw some real junk, that should not have been allowed in my opinion. What is Cynotilapia sp. OB, I have never come across that one before, and several bags that said "Aulonocara sp.?" At least that person, admitted he didn't know what he had, but is just irresponsible to allow this at a national event. In the old days.... (Okay, here I go, jumping on the soap box!) I remember each bag going through at least a couple of people to verify that the fish in the bag, was the same as what it was labeled. Hybrids would have never been allowed. I bought a bag labeled Pseudotropheus Zebra "Albino," the fish were barely 1/2" and there is no way they are albino's. I did get it for $2.00, but that is not the point. Why have auction rules, if nobody is going to follow them. There were fish that you don't see everyday, but by and large, most of the fish on the auction block, were not rare, at least to me, they were fairly common. Despite my concerns, the Auction is still and always will be one of my most favorite events, and I didn't seem to have any problems filling by fish box to the brim. I bought some Mylochromis epichorialis for Gary, he had requested some weird Haps if I saw any. This a mid-size cruiser that likes to eat crabs in the lake. I have only seen them in the books, so I couldn't pass that up. Gary also requested some Metriaclima zebra "Red", found some very nice colored ones. I was successful on a bag of Labeotropheus trewavasae, that are supposedly albino siblings. There was one male and 5 females, so I thought I would give them a try. I also got a bag of Neolamprologus tetracanthus, haven't had any of those in a while. I got a group of adults, Aulonocara sp. "Orange Tanzania," 2 males and 3 females for $12.00, I thought that was a great buy. Bought a bag of Julidochromis ornatus, that is a very good strain, so that I can beef up my own strain. All and all it was a good auction Auctioneers of note, were the irrepressible Mike Schadle and the ever entertaining Caroline Estes. I have been to plenty of ACA conventions in my day and I would have to rate this one quite high. It was filled with people I have known for many years, and that is what makes a good convention in my opinion, the people. The hotel was fine, the people were great, the fish were awesome, and I can't wait until next year. Lets have a round of applause for Ohio, for a job well done! Chin, Pam. (July 30, 2000). "ACA 2000 A Recap". Cichlid Room Companion. Retrieved on April 21, 2019, from: https://www.cichlidae.com/article.php?id=140.